Description: White-tailed deer are most recognizable by their 30cm (12in) flag-like white tail which they flash when disturbed. A relatively small deer, adult males (bucks) are larger than females (does) and can weigh up to 150 kg (331 lbs). The coat colour of white-tailed deer varies seasonally from reddish tan-brown in the summer months to grey-tan in winter. 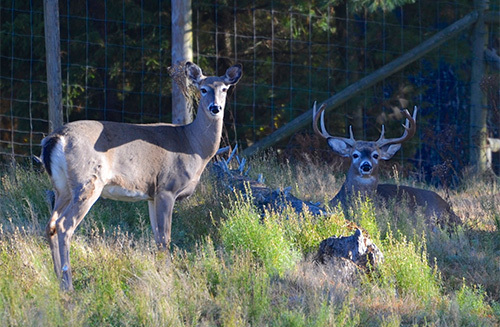 Bucks grow a set of antlers yearly, with increasing size and number of “points”. Distribution and Habitat: White-tailed deer are the most common deer species in all of North America. Found in forested areas across the continent, white-tailed deer are often also seen grazing in fields and open areas. Although not native to Nova Scotia, white-tailed deer arrived in the province over 100 years ago. It is speculated that they were first introduced by sportsmen, but white-tailed deer expanded their range drastically during the late 19th and early 20th century, moving into much of the territory they now frequent across Canada, driven by several factors including human activity and decreased competition from other deer species. White-tailed deer have difficulty at times surviving the harsh winter climate of their “new” northern habitats. As a result, their population numbers can fluctuate dramatically from year to year, decreasing due to climactic conditions and then rapidly increasing through successful breeding seasons. Diet: Like other members of the deer family, white-tailed deer are ruminants, consuming a wide variety of plant material, including twigs and tree bark in winter when desperate for food. Life Cycle: Following mating season, known as rut, in the autumn months, white-tailed deer give birth to spotted fawns in the spring. When conditions are favourable, does will often produce twins, and triplets are not uncommon. Younger does (capable of breeding by 7 months of age and delivering their first fawn at a year) tend to produce single fawns. A unique characteristic of white-tailed deer is that they tuck their young away in secluded spots and return only every 12 hours or so to nurse and check on them. People often mistakenly believe they have discovered an orphan fawn when in fact, it is not, and if left alone, its mother will return on schedule. Other than humans, white-tailed deer have many predators. In Nova Scotia, the biggest predator threat to white-tailed deer is coyotes (and domestic dogs) although black bears, bobcats and bald eagles will also prey upon fawns if given the opportunity. Adaptations: White-tailed deer fawns have very little body smell in the first few weeks of life, which helps keep them hidden from predators. Did you know? The white-tailed deer found at the park were orphaned fawns, hand-reared by park staff. Due to disease concerns, fawns are no longer raised at the park. In light of their natural tendency to reproduce prolifically and the limitations of the park to house only a certain number of individuals, the park deer have been sterilized to avoid increased numbers.